Advertisers are deserting newspapers. Using the impact of television advertising on print media in 1968, this column argues that a reduction in advertising revenues will reduce the quality of newspapers. Ultimately, this may result in a less well-informed public. The year 2015 was perhaps the worst for the newspaper industry since the recession. According to the Pew Research Center (2016), in the US total advertising revenues (print and digital) among publicly traded companies declined by nearly 8%. In a recent paper (Angelucci and Cagé 2016), we investigate the consequences of the collapse in advertising revenues on newspaper pricing and quality choices. These choices are important because they help determine how well-informed individuals are. This in turn influences voter turnout, political accountability, and social norms (Ferraz and Finan 2008, Jensen and Oster 2009, Gentzkow, Shapiro and Sinkinson 2011). Specifically, we analyse the consequences of a decline in the advertisers’ willingness to pay for newspaper readers’ attention triggered by the arrival of new advertising platforms. In 2015 Google and Facebook had captured almost two-thirds of the $60 billion online advertising market. This shift in advertising revenues toward social media has contributed to a collapse in newspaper advertising revenues. To investigate the impact of these shocks, we built a simple model in which a newspaper sells content to readers, and also sells reader attention to advertisers. We show that a decrease in the advertisers’ willingness to pay for reader’ attention induces the newspaper to decrease the quality of its content. Advertisers’ lower willingness to pay for newspaper readers leads to less 'subsidisation' of readers through low prices, which creates upward pressure on reader prices, it also leads to less 'subsidisation' of quality (which also serves to attract readers). Whenever readers are sufficiently sensitive to quality, a decline in advertising revenues leads to a decrease in subscription prices to compensate readers for lower quality. We also show that a decrease in advertisers’ willingness to pay increases the newspaper’s incentive to price discriminate between readers: in addition to decreasing its subscription price, the newspaper increases its newsstand price. Clearly, a number of factors determine newspapers’ pricing and quality choices, including costs, consumer preferences, and market structure. In addition, the rise of the internet brought about numerous far-reaching changes in terms of competition and consumer habits. According to the Reuters Institute Digital News Report (2016), for example, half of consumers report using social media as a source of news each week. As a result, establishing empirically the causal relationship between advertisers’ lower willingness to pay for newspaper readers, and newspapers’ pricing and quality choices, is difficult. There is a precedent for this: the impact of TV advertising on newspaper business models. 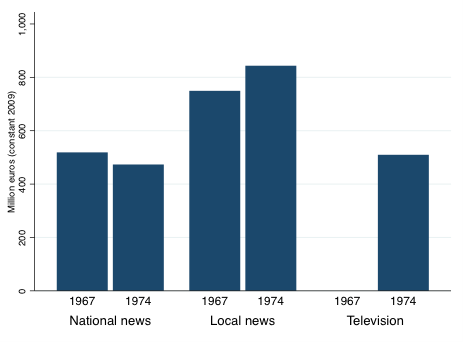 We built a dataset of French newspapers between 1960 and 1974 and perform a difference-in-differences analysis of the introduction of advertising on French television in 1968. This led to an exogenous shock that exclusively shifted newspapers’ reliance on advertising revenues. We made the assumption that advertising revenues had affected national daily newspapers more severely than local daily newspapers. Looking at the advertisements broadcast on television at the time, and those published in newspapers, supports this assumption. National newspapers relied to a greater extent on advertisements for brands whose owners may also wish to advertise on television. More advertisements in local newspapers were local in nature. To illustrate the magnitude of the shock, national newspaper advertising revenues decreased after the introduction of advertising on television even though the total French advertising market expanded between 1967 and 1974. 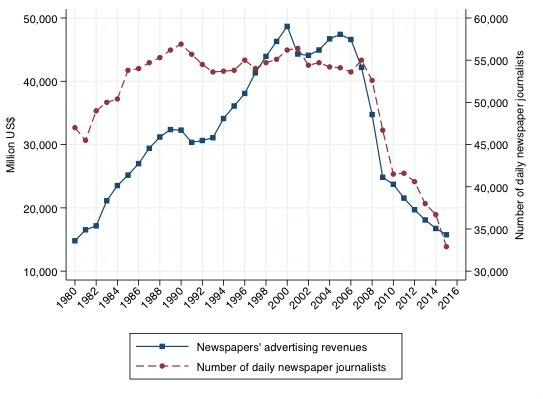 In contrast, local newspaper advertising revenues increased during the same period (Figure 1). The introduction of advertising on television led to a 17% decrease in the advertising revenues of national newspapers compared to local newspapers. This drop in advertising revenues led to a 12% decrease in the price ratio, defined as the average subscription price divided by the newsstand price, entirely driven by a decrease in the price charged to subscribers. National newspapers used 11% fewer journalists compared to local newspapers, and the surface of national newspapers dedicated to news (the 'newshole') decreased by 7%. Assuming these statistics measure quality, we can conclude that national newspapers reacted to lower advertising revenues by decreasing the quality of their content. Overall, these changes in price and content lead to a 22% increase in the share of subscribers among all readers. We believe our findings have implications for 21st-century news media. Many media outlets are still experimenting to discover optimal pricing policy. Our model suggests the logic behind using subscriptions as a means to price discriminate between readers should also exist online. Since 2010, an increasing number of online media have abandoned exclusively advertiser-financed models to introduce paywalls, and a large number have chosen to offer subscribers unlimited access to their content while charging a high price to the readers who purchase only individual stories. We also find that, in recent years, the ratio of the average subscription price divided by the newsstand price has decreased (Figure 2). Our analysis highlights that a decrease in advertisers’ willingness to pay for news readers – whatever its causes – lowers media outlets’ incentives to invest in quality. 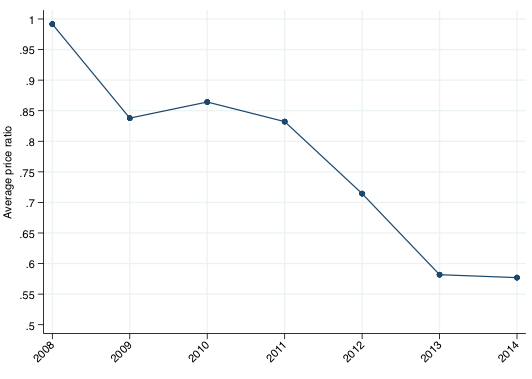 As advertising revenues have dropped, so too have the number of newspaper journalists in the US (Figure 3). If advertising revenues continue to decline, the quality of information at the media outlet level may decrease too. This risk is made stronger by a recent growth in ad-blocking technologies (Reuters Institute Digital News Report, 2016). If advertising is no longer going to subsidise newspaper quality, future research should investigate the value of possible policy interventions. Angelucci, Charles and Julia Cagé (2016) “Newspapers in Times of Low Advertising Revenues,” CEPR Discussion Paper No. 11414. Ferraz, Claudio and Frederico Finan (2008) “Exposing Corrupt Politicians: The Effects of Brazil’s Publicly Released Audits on Electoral Outcomes”, The Quarterly Journal of Economic, 123(2): 703-745. Gentzkow, Matthew, Jesse Shapiro, and Michael Sinkinson (2011) “The Effect of Newspaper Entry and Exit on Electoral Politics,” American Economic Review, 101(7): 2980-3018. Jensen, Robert and Emily Oster (2009) “The Power of TV: Cable Television and Women’s Status in India,” Quarterly Journal of Economics. Pew Research Center (2016) State of the News Media 2016.